Kids love digging, sifting, building, pouring, and exploring with sand. They love using their imaginations when given cars, trucks, people, and animals while playing in a sand box. They strengthen their small and large muscle groups as they mold wet sand into creative designs and pour dry sand through a sieve or sifter or into a funnel that funnels into a specific container. Provide kids with old cups, spoons, measuring cups, tea sets, shovels, pails, combs, shells, sticks, rocks, and rakes while playing with sand. 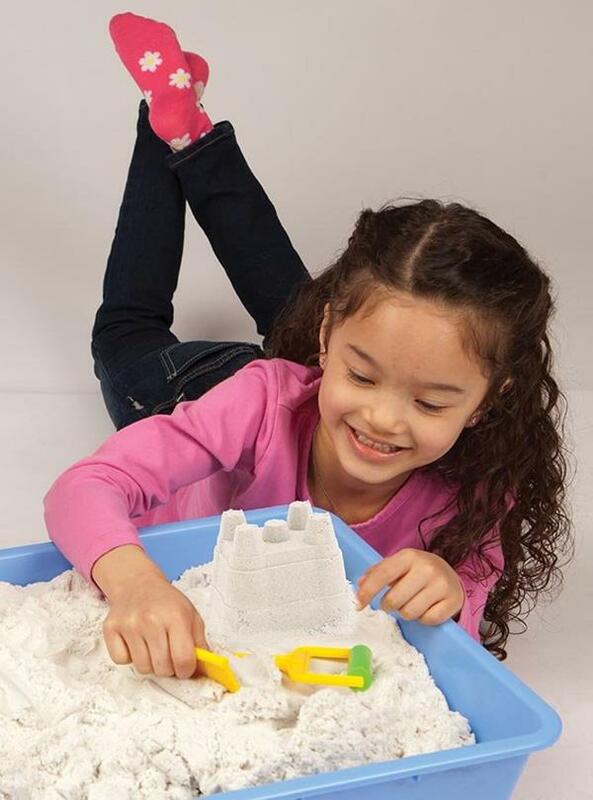 I love Portable Sand Trays and Little Sandboxes to use indoors or out any time of the year. Most children love the feeling of sand and using a sand table can provide hours of fun. I personally love using Moon Sand because it feels great and makes sculpting objects for kids easy. I prefer little sandboxes that can be used indoors or out to large outdoor sand boxes, (that cats like using for litter boxes), becasue they are easy to use and clean up. My favorite indoor sand is Moon Sand. It never dries out, needs no wather and is easy to clean up. Moon Sand can be sanitized after each use by simply spreading the sand out in the tray. Spritz the sand with any type of antibacterial disinfectant and let it air dry. Soft Phase: Moon Sand® comes in a soft malleable phase and it is just a matter of packing the material into a small form or simply modeling it with your hands. The reusable material will never dry out and can be used over and over again. Hard Phase: Place a block of Moon Sand® in a household oven for 1 hour at 250° F/125° C. Allow the block of sand to cool in the oven. It now transforms into a synthetic-like stone, and becomes an ideal carving material. All the material that is carved away can be reused since it never dries out. Water-based paints can be applied to the sculpture in the hard phase.Moon Sand® repels water, and can actually float! This enables the artist to incorporate water into their sculpture without any damage. You can use it to make personal imprints to molds for plaster or concrete. Sandtastik is a safe, non-toxic sand that contains no crystalline silica silica or quartz. Sandtastik Sand is 100% natural, environmentally friendly, safe for children of all ages and is available in over 73 colors. Sands Alives! is super-easy to mould and shape and can be used over and over again. Sands Alive! feels geat and is so soft, light, and fluffy. Anti-bacterial and non-toxic, Sands Alive! is suitable for children 3 years and up. Although it’s marketed as being not messy I have found it does stick to clothing and the kids must wash their hands well after using. Kinetic Sand is made of 98% pure sand that is covered in a nontoxic binding agent that wont stick to hands, toys, or the house. Sticks to itself, so clean up is a breeze. Unlike beach or play sand, Brookstone’s sand has special properties that make it soft and stretchy. It’s 98% sand and just 2 % polymer and non toxic. It sticks to itself but not to hands. This is a great sand to use with kids.